Nigel Adkins’ insistence on having “six big uns in your team” meant Louis Reed was always likely to be a peripheral figure at Bramall Lane last season. 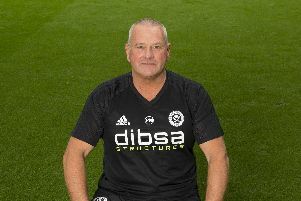 Chris Wilder’s appointment four months ago has not led to a welter of opportunities either but, after being reassured that size is not everything, at least the Sheffield United midfielder knows he will now be judged on ability rather than feet and inches. “The manager has already told us that he’s not fussed about having loads of big players,” Reed revealed. “Just so long as you do well and do your job. Reed, who stands 5ft 6in tall and weighs just inside the lightweight limit, has endured a slow start to the present campaign as new signing John Fleck, Chris Basham and Paul Coutts cement their places in United’s engine room. Nevertheless, after being omitted from the squad which beat AFC Wimbledon last weekend, the teenager hopes his experience and versatility will persuade Wilder to break up their partnership. Reed, aged 19, has worked under three different managers since being promoted from the Steelphalt Academy by Nigel Clough in 2014 and said: “We have to be playing the football the manager wants to play and force ourselves in. Reed’s solitary appearance this term came against Leicester City Under-23s in the Checkatrade Trophy. “It was good to be back out there, it’s always a pleasure to be out on the pitch,” he said. “We’re just taking every game as it comes and trying to build momentum whether that be in the cups or the league. “If the manager wants you to play, you’ve still got to go out there and do a job if you are called upon. You need to be ready to do your job at all times.